Relativistic hedonism could be described as the perennial philosophy of our age, contrary to the word of the Second Vatican Council, and this being so, then perhaps the meaningless debauchery of The Hangover is nothing less than the practical application of our common wisdom; and it is through this lens that I have come to see that perhaps The Hangover is a model for post-industrialist cosmology, a myth explaining the workings of the absurd universe as it exists cut up from all influence and origins: One must only consider two things: It is in Vegas, away from the consequences of their past lives and reputations, and the main action of the film occurs without memory of the cause, such that we are left only with the effects, the pure mechanisms of the universe, the motion, as it were, without the push. So what is the primordial stuff of which the universe is made, according to the film? Chaos, of course. Vulgarity, crime, and rudeness in such huge proportions that, as the protagonists saw, if they are to let themselves run without their conscious faculties, they will more likely end up tossed around in meaningless, violent absurdity than dead. 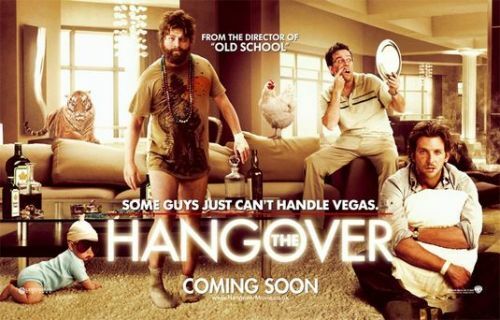 Obviously, there is no profound message to be found in The Hangover, and this lack leads us to its single assertion: Reason is undone. Somewhere, sometime, humans were left to their freedom, and succeeding this, between two points is not a determinate line but a scattered path of tigers, retired boxers, babies, lost teeth, strippers, Chinese gangsters, and so forth; and from this unruly universe, as the dictum goes: Hilarity ensues. You may also want to check out the other The Hangover review from Sting Lacson.